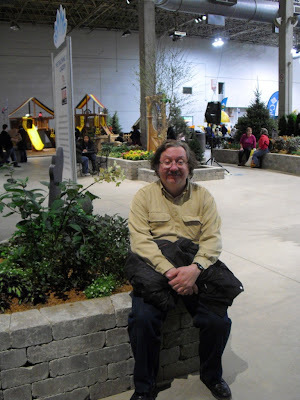 Last Monday, my husband Bob and I attended the Chicago Flower and Garden Show, at Navy Pier in Chicago. It is a bit of a tradition with us. We attended our first one together in March 2003, while we were engaged, but still in a long-distance relationship. I was living in New York and he was established here in Illinois. This was the sixth show we've attended together. We did skip the two years it was held in Rosemont, IL, as opposed to Chicago. 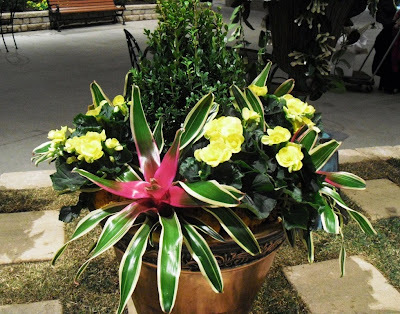 A container from the Broadway in Bloom--Four Seasons of Gardening boulevard which stretched for most of the length of the show. This year's show had a theatrical theme, entitled: "Cultivating Great Performances.". Alocasia amazonica cvv, Sansevieria trifasciata 'Laurentii' and Nephrolepsis surround a fountain near the entrance. 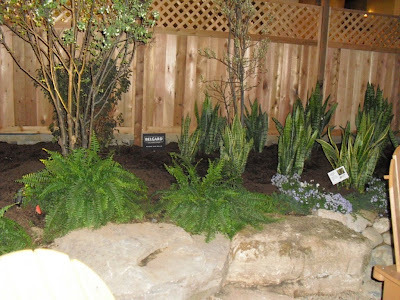 This was part of the Cultivating Great Performances Garden, which set the stage (hah) for the show. All photos benefit from being seen in their larger versions, so click away. 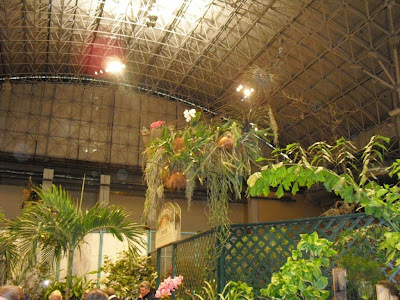 Actually, now that I think about it, one of the things I liked most about the 2010 show had the potential to make it a bit disappointing for some other show-goers: There was extensive usage of tropicals and houseplants in the exhibits, but at least, as it seemed to me, not as much space devoted to climate-appropriate garden plants as in the past. 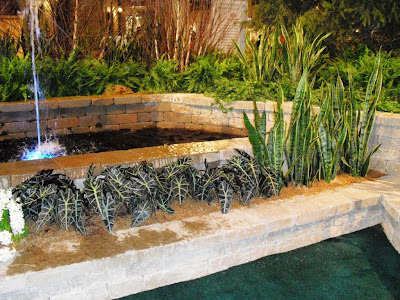 I know that while many people come to the show just to enjoy the spectacle, many others come in search of practical gardening ideas. I know, from reading the show guide, that there are classes, seminars and presentations at the show that generously cover these topics. But I'm not the sort of visitor that these appeal to. I prefer to come to wander through the exhibits, enjoy the visual impact of it all, and take photographs and a few notes, rather than sit in a classroom. I'm sure I'm not alone in that preference. The next three pictures are from the Sun & Moon--Miss Saigon: A Garden for the Day and Night exhibit. There were a variety of lighting styles to simulate different times of day, and several water features. 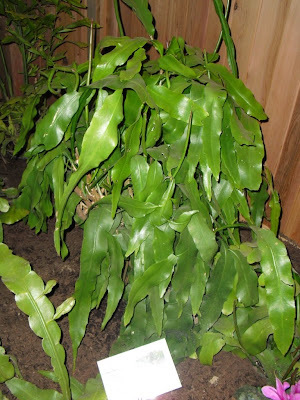 Most of the exhibit used tropical plants in the landscape. 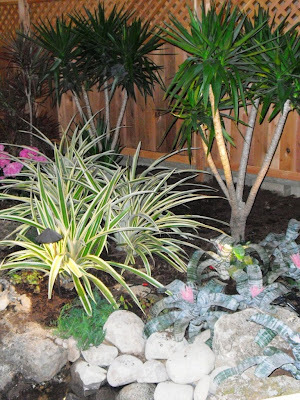 Dracaena, Yucca, and Ananas (variegated Pineapple) species, along with Aechmea fasciata. There are also pink Hydrangea plants visible. More hanging loveliness, along with a glimpse of some of the Palms on the ground. My darling Bob, taking a little break, as I ran around taking pictures like a madwoman. 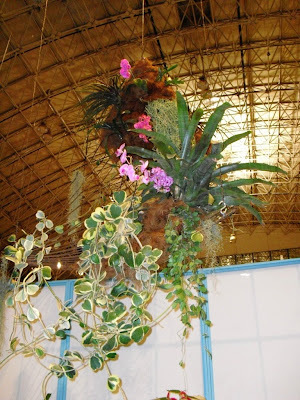 Part 2 will contain more photographs from those exhibits that did feature more Illinois-friendly garden ideas, as well as more tropicals, and more of my thoughts on the show. I totally missed the "Miss Saigon" garden. Now I'm bummed because it looks pretty cool! I didn't know you were going to the show....a number of us local garden bloggers went together and hung out one of the days. Had I know you were coming I would've told you about the dates so you we could've said hello. @MrBrownThumb: I'm sorry I missed the opportunity to meet you and the other bloggers. I do attend every year, though it depends on what day my husband can get off. I always attend on a weekday. After 10 years of dealing with weekend crowds and their behavior at my former museum job, I almost never go to any public venue on a weekend if there are alternatives.